GOSHEN, N.Y. (May 24, 2016) – The Glen Arden Continuing Care Community will mark 20 years as a retirement living community in Orange County with events on June 1, 3 and 4 which will commemorate its 1996 opening. Since 1996, seniors age 62 and older have lived at Glen Arden knowing they can maintain their independent lifestyle with the assurance of long-term care. Wednesday, June 1: 6:30 to 8:15 p.m.: “Musical Celebration” featuring the New York Swing Exchange and WHUD radio station at Glen Arden. Friday, June 3: 11 a.m. to 3 p.m.: A community health fair featuring glaucoma, macular degeneration, cataract and hearing screenings in addition to information on stress management, the important of hydration and sugar elimination in one’s diet and Alzheimer’s disease. There will also be samples of wellness products in addition to Zumba Gold and yoga demonstrations, bocce ball and shuffleboard. The first residents moved into their new homes on June 1, 1996, but the idea of developing senior housing in the mid-Hudson area dates back to 1988, where focus groups and feasibility studies were undertaken to see what kind of senior housing was needed. Results showed a demand for life care communities. With no legislation in place to allow for their development, seniors were forced to migrate to other states. The first legislation — as restrictive as it was — was passed in 1989. No financing was available without a community being successfully pre-marketed. With assistance from State Sen. William Larkin, legislation was successfully amended in 1990, enabling Arden Hill Life Care Center (incorporated in 1983) to move forward with plans for Glen Arden. 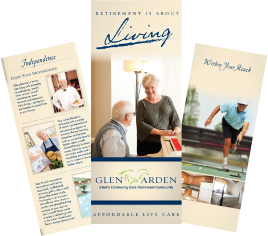 In 1992, the Glen Arden Life Care Retirement Community was incorporated. It was the first life care community to undertake the approval process required by the New York Life Care Council, which represented the New York State Departments of Health, Social Services, Insurance and Office for the Aging in addition to members of the health care industry and consumers. In 1994, Larkin again assisted in further legislation amendments to allow non-profit life care communities to be financed by local Industrial Development Agencies. On the marketing front, residency agreements began to be offered, providing future residents with medical acceptance and entrance fees for their apartments. Bond financing was eventually secured through the Orange County IDA with a public bond offering of $50 million. Months before Glen Arden opened, 129 apartments were reserved with deposits. Construction began in 1995. At 245,000 square feet, Glen Arden was one of the largest construction projects in Orange County at the time. A year later, residents moved into the facility. Today, Glen Arden’s residents continue to be involved in the Goshen and greater Orange County communities. Local organizations like BOCES and area schools are involved in Glen Arden’s regular activities in addition to local Girl Scout and Boy Scout groups. Glen Arden residents and staff support local organizations throughout the year through efforts like food drives for local food pantries and floats for parades. The Goshen Rotary Club and Goshen Chamber of Commerce hold their meetings at Glen Arden. To RSVP, contact the marketing office via email at info@glenardenny.com or call 845-360-1469.